Strange things have happened this weekend. I, master skeptic of all nineties trends, have bought a pair of culottes. Before you all go and think I bought a cutesy pastel colored pair with floral print: hold your horses. I have my limits. Like one would expect of a basic chick like myself, I chose basic black culottes avec front pleat (from H&M, only €45!). 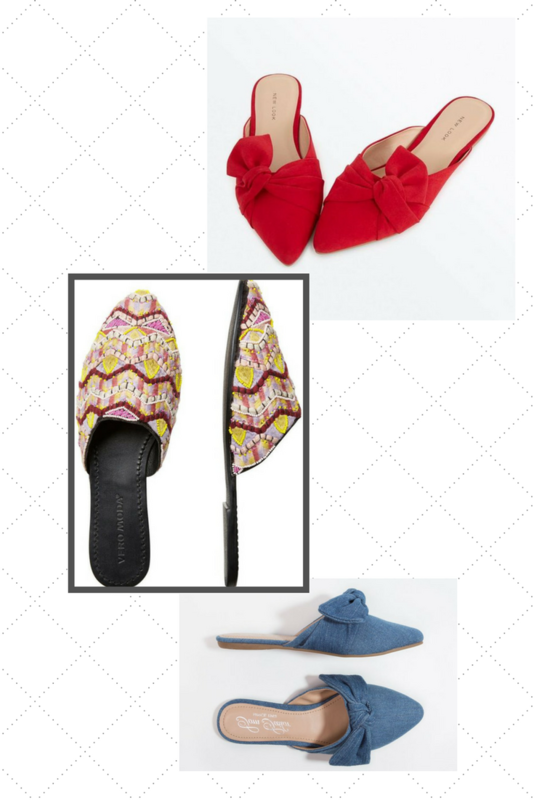 After shopping a bright pink blazer, candy pink sweater and even pastel things last month I thought it was about time I pulled myself back together and bought more closet workhorses to help combine my new spring-summer pieces into cute looks. And then I came home with my new pair of culottes – which my boyfriend surprisingly really likes – and realized that I don’t have any shoes to wear with it. So, what does the fashionable crowd wear with culottes? Pinterest tells me the answer is sneakers and mules. On a mission I went. I found matching sneakers pretty easily. I ordered a flashy pair of Karhu sneakers from Van Arendonk (more of their damesschoenen here). It was love at first sight when I took them out of their box! You might have spotted them on my Instagram stories already and I will try to share them here on the blog really soon as well. But mules… man, mules are hard to find! It certainly didn’t help that I had an image in my head of what the perfect pair would look like for me, haha. I imagined a pointed toe blush pink pair, with a knotted detail. Preferably for under €30. All my travels have left me broke and I can’t afford expensive shoes at this time. I probably don’t have to tell you which of the three pair in this collage is currently standing next to me on my desk? I really loved the grey pair as well and only had just enough willpower to hold myself back from buying those too. If you see the prices you will understand that buying the two pairs wouldn’t have been unreasonable… . On a recent trip to Paris I spotted a gorgeous pair of woven-style mules in a tan color. They were €100 and I couldn’t justify buying a pair of slippers that expensive considering how little I’d probably wear them. Their image somehow stuck with me and I have tried to find a similar pair in affordable shops, but I didn’t have much luck. The pairs above are the closest matches I could find. I love the playful tassels on the pair from Glamourous. They are perfect for a summer holiday, but maybe less appropriate for everyday wear. The white woven mules from Topshop have made appearances on Instagram already and are promising to become a blogger favorite this season. If I didn’t have a grain of reason in my brains, all three pairs would be standing in my wardrobe right now. The beaded pair would look SO lovely under white dresses in summer. The jeans pair was meant to be worn with white skinny jeans (my fave during summer!). And the red pair? Oh, wouldn’t it be the most comfortable replacement for killer heels on a summer-y date night? These eye-catches have the potential to make a plain outfit more fun and interesting. I’ll stick with my blush pink suedette pair for now, but if those beaded mules ever go on sale… .